Opening the meeting on Wednesday afternoon, the Cardinal brought the Pope’s welcome greeting to those present. Pope Francis will meet the participants on Thursday afternoon, at the end of the retreat. This two-day visit to the Vatican was approved by the Pope following a proposal presented by the Archbishop of Canterbury and Primate of the Anglican Community, Justin Welby, who thought it could be a “spiritual, ecumenical and diplomatic” initiative, said Cardinal Parolin. The Vatican Secretary of State described the retreat as an “opportunity” for encounter and reconciliation in the spirit of “respect and trust” for those who “at this moment have the special mission and responsibility to work for the development” of South Sudan. In 2013, the country plunged into a bloody civil war, which left at least 400,000 people dead. While still on his way to Rome, the Archbishop of Canterbury, Justin Welby, sent his greetings and thanks to the Holy Father for his hospitality “in his home” to the participants, underlining Pope Francis’ concern for South Sudan, and hoping that the Holy Spirit would “rest” on all the leaders of the country, whether present at the retreat or not. In his remarks at the retreat, Jesuit Father Agbonkhianmeghe Orobator dwelt on the true meaning of a spiritual retreat, understood as a time “to meet God” or, even better, as a time “for God to meet us”. The Lord, he explained, “will speak to us here”, not by “cell phones”, or “through Twitter or Facebook or Instagram”, but in a retreat of healing, purification and mission as “artisans of peace”. 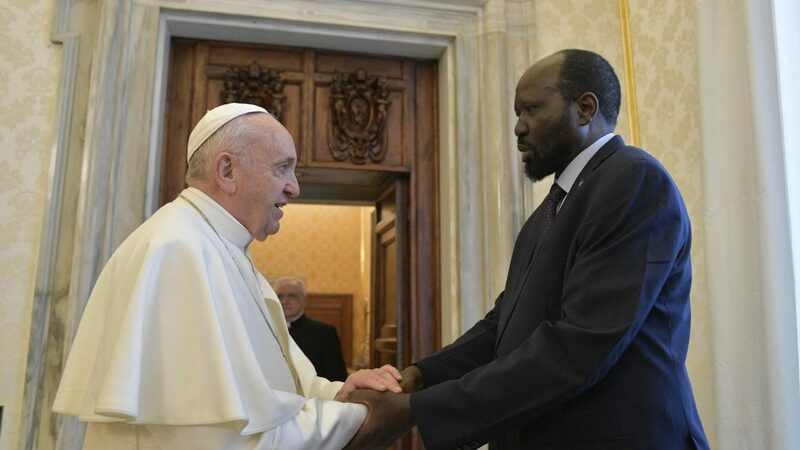 The invitation is to speak “to one another” from the depths of our hearts, enlightened by the Spirit, never forgetting the 13 million inhabitants of South Sudan, so that the peace agreement may be signed, above all, “in our hearts”. The President of the Conference of Major Superiors of Africa and Madagascar, in the second part of the Wednesday afternoon session, extended his reflection to the South Sudanese national anthem, “South Sudan Oyee!”. He urged those present to listen to the anthem during the retreat. In it, he explained, God is mentioned twice, at the beginning and at the end. The people of South Sudan, said Fr Orobator, are people “of faith”, who with “one voice” pray, glorify and express trust in the Lord, in “peace and harmony”. The country’s greatest resource and wealth, he added, is not in its land, water or oil: it is its people. He recalled the day of independence from Khartoum, on the 9th of July 2011: in all South Sudanese people, of every ethnicity, there was joy, euphoria, jubilation because the nation “was born”, with hopes for peace, justice, prosperity, freedom, he said. Yet in the country today there are “7 million people”, “almost half of the entire population”, who are reduced to extreme hunger, schools are being abandoned because of inter-community violence and between clans; 4 million people have been forced to leave their homes, taking refuge in refugee camps. Fr Orobator concluded with an invitation to recover the “dream” of the national anthem, going beyond “hostility” and “misunderstanding”, choosing between war and peace: choosing “life”, for a reconciliation that is not only “personal”, but “national”.